It’s easy to get lost in this 1970’s futuristic downtown landmark with so many identical areas and repeating patterns. The only way out appears to be through the ceiling via the glass elevators. Yes, the elevators are the star attraction of this building (check out the plaques at each identical elevator listing their movie appearances). Some say they were inspired by the (spirit-designed) open-air elevator shafts of the Bradbury Building a couple of blocks away. For others, breaking through the glass ceiling brings to mind the “Wonkavator” from “Willy Wonka and the Chocolate Factory.” Their ability to travel along the exterior skin of the hotel (past the windows to the suites) also earned them an entry into the book “L.A. Bizarro” as “L.A.’s Premier Moving Peep Show.” We, at GHOULA, prefer to think of these elevators as a metaphor for the ascent to heaven, after one dies. Even the 80’s TV show, “It’s a Living,” (set in the bar on the roof) eludes to life and death in its title. Speaking of dying and/or being trapped in brutalist prison-like architecture. The Bonaventure Hotel is home to at least one trapped spirit… in the underground parking garage. The hotel sits on top of Los Angeles’ original subway route, a portion of a Pacific Electric “Red Car” line that went underground. During the hotel’s construction, the old subway tunnel was caved-in to build the foundation (and parking garage). However, a section of that original tunnel still exists, starting from the Subway Terminal Building (417 South Hill Street) and ending at the Bonaventure. 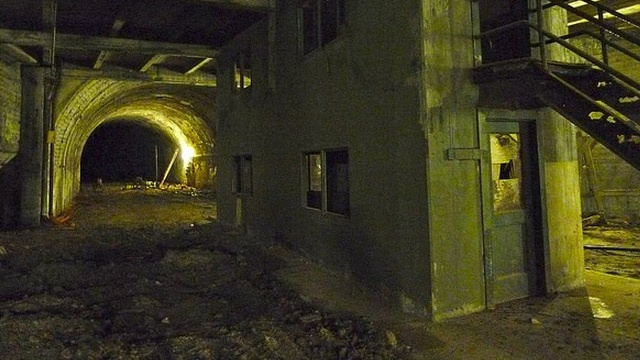 Hidden from the public, this tunnel can be accessed from the Terminal Building and from the nearby Biltmore Hotel. Those that have entered this forgotten corridor have claimed to have seen a little red-hared girl, maybe 7 years old. No one knows her identity or why she wanders these tracks. According to local lore, those that have seen this little girl are so frightened by the sight that they mark the spot where they saw her (with a spray-painted cross) to warn others. Supposedly, this otherwise empty tunnel is filled with painted crosses, lining the walls. Could the “presence” that frightens garage attendants be the ghost of this frustrated redhead, forever sealed into that abandoned tunnel, her own underground tomb? Come out to LA’s largest hotel (over 1300 rooms), and drink a toast to LA’s scariest readhead… if you dare.